Tuesday, October 7 will mark 13 years since the devastating US invasion of Afghanistan. 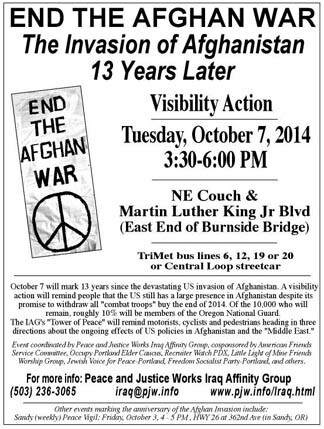 A visibility action at the east end of th Burnside Bridge from 3:30 to 6 PM that day will remind people that the US still has a large presence in Afghanistan despite its promise to withdraw all "combat troops" buy the end of 2014. Of the 10,000 who will remain, roughly 10% will be members of the Oregon National Guard. The Peace and Justice Works "Tower of Peace" will remind motorists, cyclists and pedestrians heading in three directions about the ongoing effects of US policies in Afghanistan and the "Middle East." On August 8th, the US began bombing in Iraq again, in an effort to "degrade and destroy" the Islamic State. On September 22, US missiles began raining down on Syria as part of that effort. While the President has promised "no boots on the ground," war is war, by land, sea or air. Event coordinated by Peace and Justice Works Iraq Affinity Group, cosponsored by American Friends Service Committee, Occupy Portland Elder Caucus, Recruiter Watch PDX, Little Light of Mine Friends Worship Group, Jewish Voice for Peace-Portland, Freedom Socialist Party-Portland, and others. For more info contact Peace and Justice Works Iraq Affinity Group at (503) 236-3065 or iraq@pjw.info. A flyer for this event can be found at <http://www.pjw.info/afghan_13yl_flyer.pdf >.